Isn't that image great? So cute and so elegant. And it can be used for so many occasions. I love it! I colored the image with Promarkers (Oatmeal, Blossom, Sky blue, Henna). Just champagne was colored with my Faber Castell pencils. I made this card in one of my favourite color combinations. :) I didn't want to add many embellishments onto this card (which is kinda strange, because usually I want to cover the whole card with embellies lol), I want the image to be in the center of attention. That's why there are no flowers and bling bling thingies this time. I just added a doily lace in the background and I made a small bow which I added on the side. I used Spellbinders die (one of them from the "Fancy tags" set) fot the tag in the bottom. 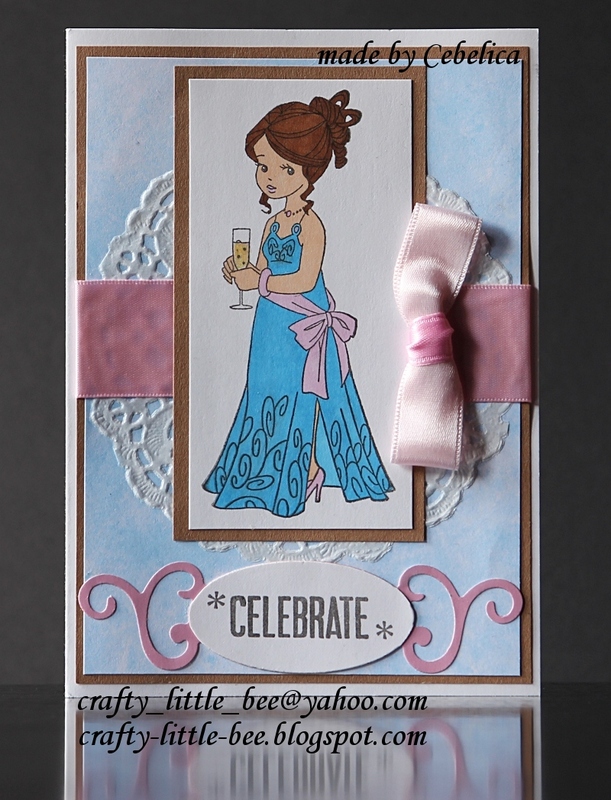 I stamped "celebrate" with G studio's clear stamp. The blue paper I used in the background is from Provo Craft. gorgeous card cebelica.i love this stunning image and your colours and details are fab. Gorgeous card, hun! Love the sweet image and coloured beautifully too! Ful lepo. Pa vidm da si že profesionalka v barvanju s pro markerji. :) Super si nardila. Pa mašnca je tut cute. What a real beautiful card, love those colours. Thanks for playing along with us at SFC. This image is so beautiful and you have selected really nice colours. Fab colouring too. Beautiful card Cebelica. Love the pretty image and fab sentiment. Thank You for the lovely award hun. Lovely card! She is sooo beautiful, and your coloring is perfect! Simply beautiful.. Love the image and the colors are wonderful.. very lovely work..
Hi sweetie gorgeous card I soooo love the image she looks so beautiful I agree about her being centre of attention she really deserves to be. Fabulous card hun. Perfectly colored image to help us celebrate the RI Blogaversary. Thanks for joining us! What a pretty card! Thanks so much for joining in the anniversary celebration at Repeat Impressions! This is adorable! Thanks for joining us at SFC. Love this card! Perfect image for a celebration. The lacy doily is fantastic! Such a super sweet card!! Love it! Thank you so much for joining us this week at The Shabby Tea Room! And good luck in my giveaway! So sweet, just a darling card! Oh what a pretty image and great colors! Thanks for joining us for our Birthday Bash at The Shabby Tea Room! Lovely card, I love the doily peeking from behind the image- what a sweet touch. What a wonderful card !!! Thanks for joining us at Stamps & Fun = CREATIVITY this time. Can you guess my favourite colour?